As it so often does, last night’s MufuChat got me thinking. 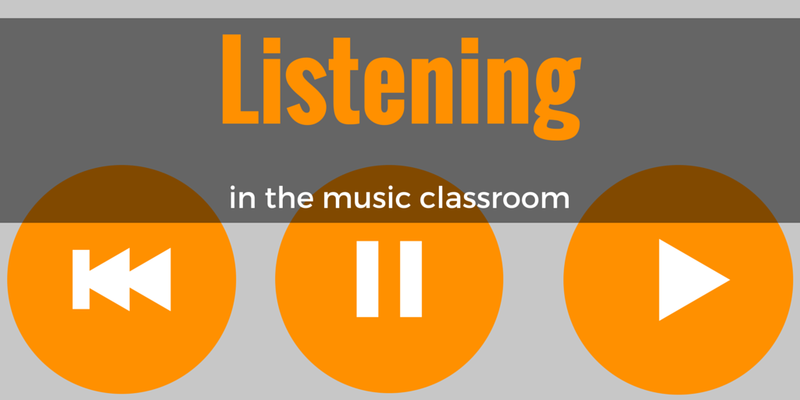 The topic was the mildly provocative ‘What is the point of getting students to listen to music in class?’ and it opened up a lot of discussion about what actually constitutes listening and why it’s useful (or not) for pupils and music teachers themselves. Broadly speaking, there were two main perspectives in the chat: formal listening and integrated listening. Of these, the only one that I’m cautious of is the preparation for GCSE Music. The reality is that the majority (in most schools, the overwhelming majority) of pupils will not go on to study music when it comes to GCSE. Even then, I feel that the actual skills the pupils need can be better developed through practical activities than through formal listening exercises. A pupil who needs to understand the term legato for a GCSE listening exam will be much better at identifying and verbalising it if (s)he has learnt the term through performance. When it comes to music education, I will always find it hard to justify an activity at KS3 on the basis that it’s good preparation for music at KS4. It’s even harder to justify when what you actually want them to learn (the ability to recognise and identify musical sound) is likely to be more effectively taught through practical activities. This caused me to stop and think for a minute. If we were to look at the ‘likely’ path of our pupils, then more of them will probably spend time listening to music than performing/composing it. Rachel’s point is a great extension of my own logic when it comes to not planning KS3 as preparation for KS4 – if the majority of our pupils are only likely to listen to music, then why plan performance activities? I guess that the answer to this question requires a return to my original argument for integrated listening – if we want to improve their listening skills and help them to get the most from it, then the most efficient way I know to achieve that is through practical performing and composing activities. Pupils are likely to better analyse, understand and identify with music if they’ve performed it.